When I brought you the Torn Croutons earlier, I teased you with a glimpse of my current favourite salad; Blackened Salmon Caesar Salad. This is the ultimate entrée salad for this time of year. Salmon makes it Lenten friendly, waist-line friendly, clock-friendly and wallet friendly. Blackening the salmon gives it a little extra punch of flavour to boost us through the protracted cold snap. Raise you’re hand if you’re feeling pretty ready for a thaw right about now. Blackened Salmon Caesar Salad does the trick for me, friends. Even if it’s still negative five billion outside -give or take a few degrees- I can eat fresh food like I’m the Queen of Summer. And I do. Because OH MY GOSH I NEED TO SEE SOMETHING GREEN. 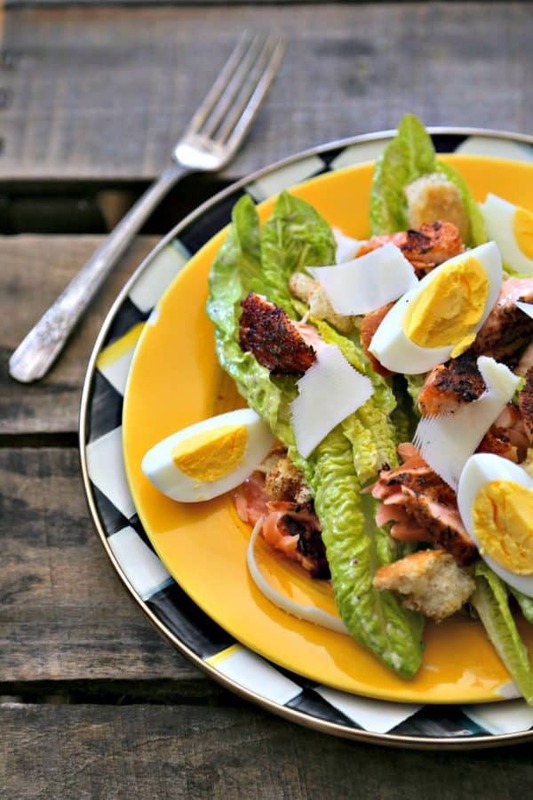 Blackened Salmon Caesar Salad is a hearty dose of crisp romaine greens tossed with luscious Caesar dressing and topped with flaked Blackened Salmon, torn croutons, hard-boiled eggs, and some shaved Parmesan cheese. That’s it! And handily, you can either make it with salmon you’ve cooked just for the occasion, or with leftover filets from a Blackened Salmon dinner. Either way it’s dinner and it. is. delicious. and Torn Croutons. Along with these three things, you’ll need romaine lettuce, hard boiled eggs, and a block of Parmesan cheese. Once you have all those components, it’s just a matter of assembly and diving face first into the plate. Don’t put your hot salmon directly onto the salad. You’ll want to let it cool at least 10 minutes before flaking and piling on top of your salad. Otherwise, you’ll have a wilted Caesar salad which just kind of sounds sad to me. 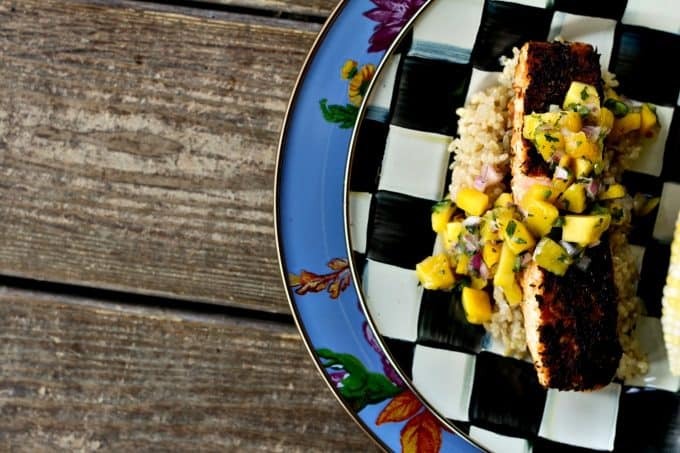 This is why leftover Cajun Blackened Salmon is a great option for our salad. 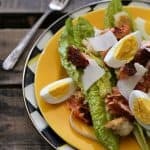 I love to make my Blackened Salmon Caesar Salads with whole romaine leaves because I love the look and the feel of the salad this way. I simply core the romaine hearts and separate the leaves gently before dropping into my giant mixing bowl. If, however, you’re not into the eat-your-salad-with-a-knife-and-fork idea, you’re welcome to tear the leaves into more bite sized pieces. 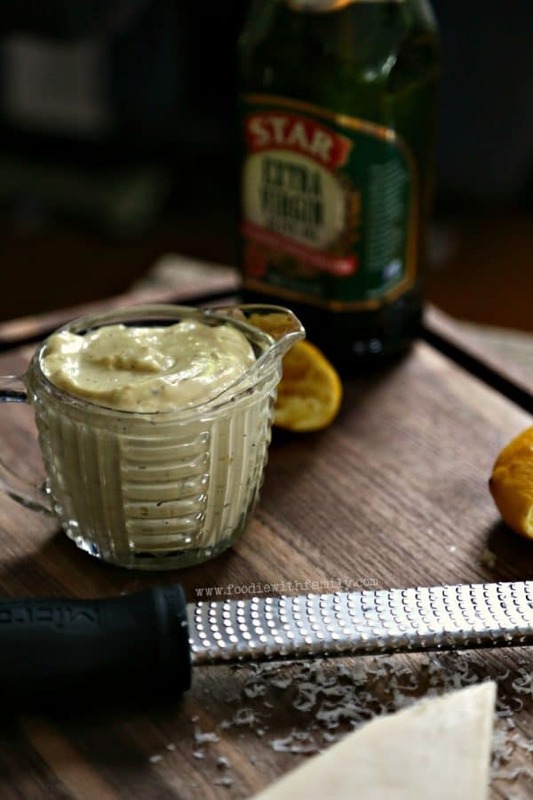 I use my Thick Caesar Dressing almost as a rule. If you have a jarred one you prefer, go for it. While we’re discussing dressing, I have to tell you that the best way to dress a Caesar salad is with your hands. Oh sure, it’s a little “Like Water for Chocolate”esque, but the truth is that you get the dressing into all the nooks and crevices of the wrinkly romaine lettuce which gives a better overall PUNCH of Caesar dressing. If you’re too grossed out by using good clean hands to toss your salad, go for tongs and toss them gently. Above all, though, be gentle when you dress the leaves. …still on the subject of dressing, how much you use is highly subjective. I prefer a lightly to moderately dressed salad, so I go for a ratio of about 1/4 cup to each large head of romaine dressing. Adjust upward if you prefer a more heavily dressed salad. Torn croutons are the best here, but if you don’t have the inclination, a good bagged Caesar crouton will be alright. Let’s talk cheese for a moment, shall we? The ideal cheese on a Blackened Salmon Caesar Salad is shaved from a wedge of Parmesan cheese with a vegetable peeler. This gives nice little accents of salty cheese rather than the giant pile of white fluff you’d get from grating it which has a tendency to overpower all of the other flavours in the salad. Are you a big salmon fan? Try these recipes for Easy Paleo Pecan-Crusted Salmon, Perfect Grilled Salmon, Salmon + Greens Asian Noodle Bowls, Honey Sriracha Glazed Salmon Bites, Easy Grilled Salmon Recipe in Foil, and Smoked Salmon Cucumber Pizza. Toss the whole romaine leaves with the Caesar dressing, using your hands to work the dressing into all the crevices of the leaves. 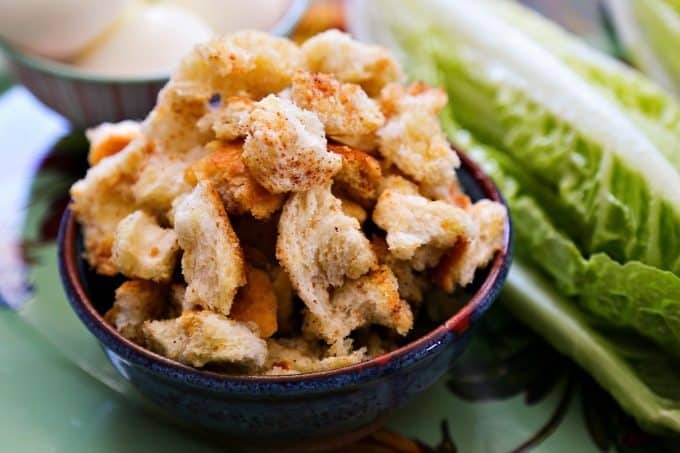 Toss in the croutons. 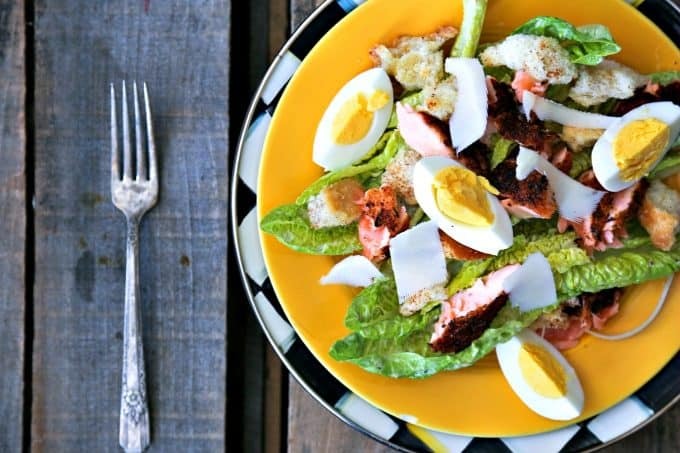 Arrange on plates, flake and top with the Blackened Salmon, hard boiled egg, and Parmesan cheese. This post was originally published February 27th, 2015. This looks so delicious and packed full of antioxidants! Those are some beautifully hardboiled eggs as well! Love this recipe!